That was the number of games the Sarnia Sting needed to win to set the club record for single-season victories. On Sunday afternoon, the Owen Sound Attack came to The Hive. It was billet appreciation day, and the Sting showed their tremendous thanks for everything our local host families do each and every day. 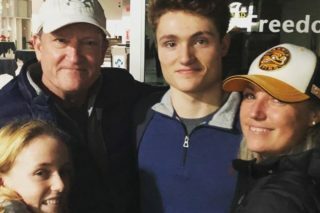 In a game that looked like it would swing entirely in the Attack’s direction, the Sting mounted a huge third period comeback before taking the game in overtime. At one point down 3-0, Sarnia stormed back to emerge with a 5-4 victory. It was an incredible end to a crazy game. Going back to Tuesday, the Sting took on the new and improved Kitchener Rangers. Both the Sting and Rangers made major additions at the trade deadline. Games between these two are must-watch hockey. This battle was no exception. Despite the final score leaning 6-3 in favour of the Blueshirts, this was a back-and-forth contest throughout the evening. Jonathan Ang and Adam Ruzicka led the way up front for the Sting. Ruzicka had a goal and assist each, and Ang scored a beauty of a breakaway goal. Nick Grima had a strong game on the back end. Sting captain Jordan Kyrou became the first OHL skater to reach the 100-point mark this season. With his assist on Ruzicka’s third period goal, Kyrou cruised up into triple digits. Moving into Friday night, the Sting squared off with the league-leading Sault Ste. Marie Greyhounds. Now this, this was a game. Sarnia goaltender Aidan Hughes was outstanding. Hughes stood tall throughout the night, but the Soo took it 6-5 in a shootout. Drake Rymsha had two goals for the Sting. Cam Dineen, Mitch Eliot, and Franco Sproviero also scored. Rymsha tied the score at 5-5 with a minute to play. The Sting had some incredible chances in overtime, but Soo goalie Matthew Villalta stole the win. It was exactly the type of Sting hockey fans are looking forward to seeing in the playoffs. Kyrou co-leads the league in points with 105; Kyrou leads the league in assists with 69; Ruzicka co-leads with nine game-winning goals. The Sting are preparing to finish off their regular season schedule, and all remaining games will be against Midwest division opponents. This week, Sarnia once again begins with a road trip to the Kitchener Memorial Auditorium. The Sting and Rangers are set for their second battle on consecutive Tuesdays. It will be the second of three matchups these two will play in the last two weeks of the regular season. Puck drop at The Aud is once again 7:00 PM. 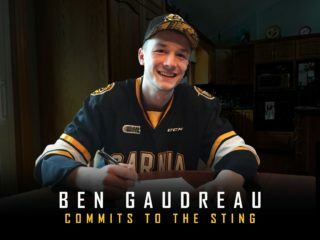 In the Sting’s only weekend game, they’ll host the Guelph Storm on Saturday night. The Storm are lining up as a potential first round playoff opponent. Guelph is led by Isaac Ratcliffe up front, draft-eligible Ryan Merkley on defence, and Anthony Popovich between the pipes. Game time is 7:05 PM at The Hive. Make sure to buy tickets for all your Sting home games by clicking here!